I am a big believer in synergy – the idea that contributions from a variety of sources can produce something that is greater than each of the component parts. If there is a word that embodies the “mudhen” culture, it is synergy. I sometimes get feedback from people surprised that I openly share the details of how things are made here on the blog, but really this is only a reflection of the larger professional community of which I am part. You never know what small insight on your part might spark a still better idea from a colleague, which in turn might lead another to yet more advances. Thanks to the internet and social media, there is a pretty steady stream of shop talk between most of the ceramic producers. Even so, there is nothing like an in-person gathering. For many years several of us gathered in the spring for “Mayhem”, but for the last few years life has gotten in the way for all of us. We decided that this needed to change in 2012, and plans were made to gather once more in Boise. This year the usual suspects – Sarah Minkiewicz-Breunig and her husband Chris Breunig, Joanie Berkwitz, and Lynn Fraley – were joined by a new addition. 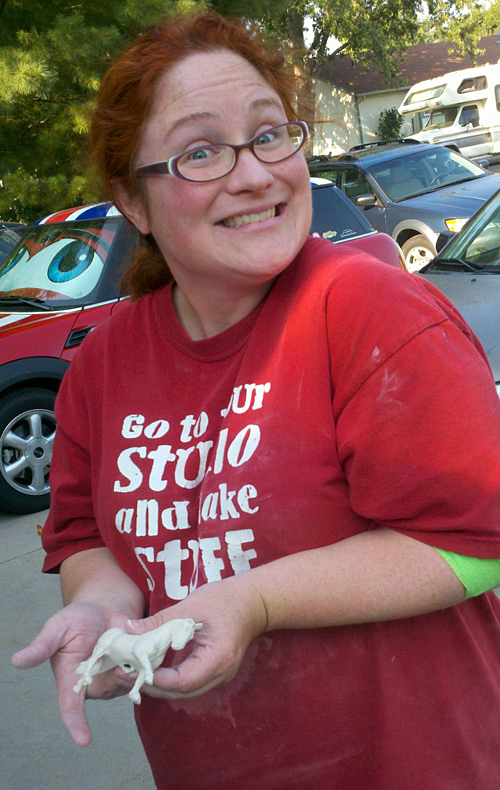 That was Karen Gerhardt of Wizard’s Vale. Karen is an overglaze artist, so her methods are significantly different from those used by underglazers, but more on that in a bit! For the moment the important part was that Karen finally gave our gathering a name – Mudhenge. It had a much better ring to it than Not-Really-In-May-Mayhem! 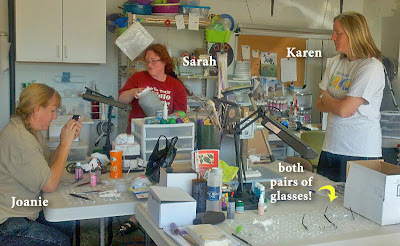 Sarah had somehow managed to transform her studio into five separate work stations, complete with personalized gift baskets. Exchanging small gifts is a bit of a tradition at our gatherings. 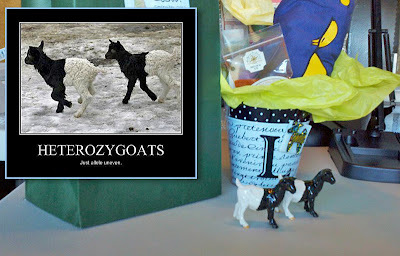 My personal favorite were a pair of Loza Goats that Joanie glazed as “Heterozygoats” for me. It’s hard to go wrong with friends who understand your genetics geek puns. Our original plan was to all arrive over the weekend so that we could attend Art in the Park in Boise. Unfortunately, I would end up sabotaging that idea. 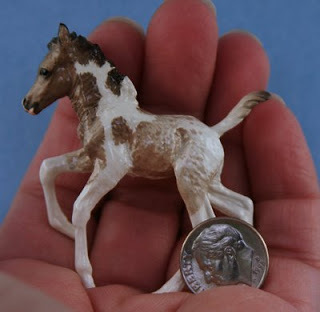 Quite a few years ago I attended Lynn Fraley’s Wire to Winny seminar. It was my first trip to Boise, and only one of a handful of trips I had ever made out West. Within a day of my arrival, I was terribly sick, and by the second evening I was admitted to the hospital suffering from severe dehydration. At the time I chalked it up to the long flight and the drier climate, and perhaps the stress of having lost my twin a few months prior. It was not an issue again, at least not to that extent, until last summer when my family traveled to Germany. By the next morning, I was not feeling well so I encouraged the gals to go to Art in the Park without me. 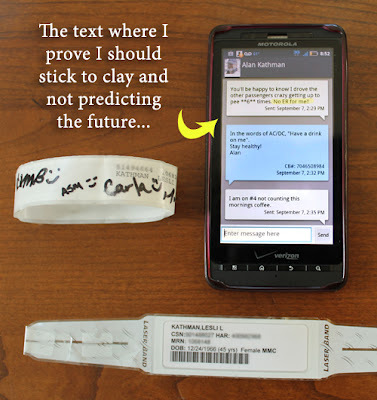 By lunch, I was sending my husband a text informing him that I was on my way to the ER. I am happy to report that the staff there are just as friendly as they were the first time, but I am left with a mystery. Dehydration is obviously the end result, but not the original cause. Needless to say, I am hoping my own doctor can solve the problem, because Boise is a long drive from Charlotte. Sarah, Chris and I did manage to go back to Art in the Park the next day. I love craft shows, especially when they are juried. 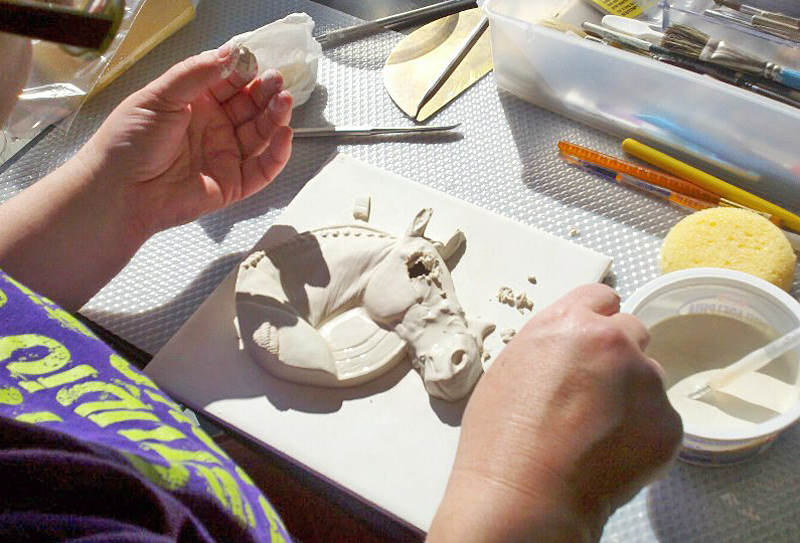 I have never had the kind – or quantity – of product that was suited to selling at shows, but I do find the way other craftspeople market themselves fascinating. 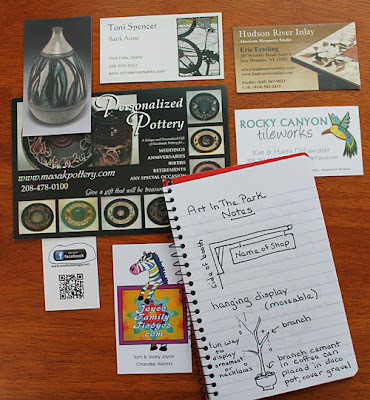 It was interesting to see how many artists had promotional materials (which were more diverse than just business cards, thanks to companies like Vistaprint and Moo) that tied into social media sites like Facebook or online craft sites like Etsy. Because the show did not allow photos, I took extensive notes about products and displays. I was particularly taken with the combination of ceramic tile components and mosaics done by Rocky Canyon Tileworks. Probably my favorite booth was the one for Masak Pottery. 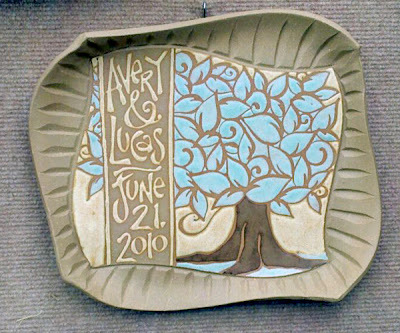 They make personalized stoneware plates and trays. The folks at the booth allowed me to take a forbidden photo so that I could give them the color scheme when I ordered. Alan and I are planning to renew our marriage vows for our 20th anniversary, and I wanted to have a pottery chalice and paten made for the service. I loved this particular design and the color scheme. The Masak pieces reminded me how much I would like to work some more with text on tiles. I loved the informal, organic quality of the lettering, and how well it worked with their various designs. After a partial day at the show and a quiet evening, I was back on track for the week. Monday was to be our first real work day, and I was ready. So instead of a project, we were looking at targeted exchanges of ideas. 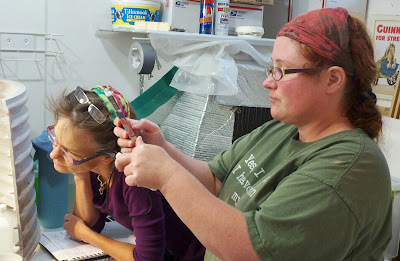 Monday was for Joanie to share her methods for getting soft color transitions in underglaze on textured sculptures. Because the usual methods for working in underglaze involve latex masking and etching, we tend to get crisp edges. The fact that you can only work light-to-dark further stymies attempts to get softer outlines. Joan had been using a combination of freehand airbrushing and erasing (which is how we ordinarily get dapples) for this, and it was one of the things I was most keen to see. I have to admit, though, that I was intimidated. I suffer from perfectionism, which I usually prefer to call a preference for meticulous execution. In actual practice, that “meticulous” execution can easily slide into no execution at all. If I am not careful, my desire to get things just right can turn into a road block where I get nothing done – or at least nothing finished. When I am working consistently, this is not usually a problem. But I have been away from the studio, and underglazing in particular, for the better part of a year. This is when paralyzing perfectionism tends to take over. All the factors that make that problem worse were there. A new (valuable!) mold. Unfamiliar tools and environment. And – the horror! – someone was going to ask me to give up my masking. Airbrushing is my weakest skill set, so I tend to use masking and handpainting as compensating props. Still, peer pressure can be a good thing. A few warning glares and Joanie convinced me to put the bottle of latex down. I wasn’t going to learn her approach if I retreated back to what I knew. So it was a few days of no-safety-net glazing, but I was pleased with the results. 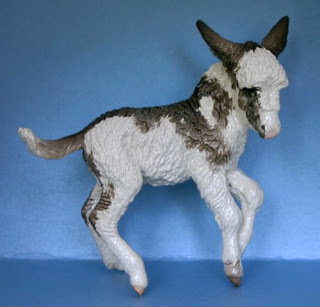 I gave him to Sarah, who named him Mudhengie in honor of our gathering. I like that my leap-of-faith foal lives with Sarah, who is about as incautious in her approach to work as I am cautious! 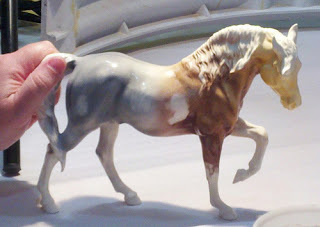 In the evenings of the days spent working on underglazing, I presented two of my more recent horse color seminars. Because it was more informal than my usual venues, I opened the floor to comments and questions as we went along. Normally I have a strict rule about leaving questions until the end, since it is the only way to control my own meandering style. I was quite tickled with how well the back-and-forth worked in a small group setting like that. That kind of real time feedback is a very valuable thing, especially as I look to the future volumes of Equine Tapestry. With underglazing and horse color behind us, it was time for the part we were all most keen about. As I mentioned before, Karen uses a different type of system from the rest of us. Our color goes on first, under the glaze, which is applied at the end. Karen is a china painter, so her glaze goes on first and then the color is applied over it. We were all eager to see how this approach could give us more “tools in the toolbox” for our work. Sarah’s recent Facebook images and blog post tell this story better than I could. Suffice it to say that Karen is a wonderful instructor, and Lynn (who offered her studio for this part of the week) is an incredibly gracious hostess. Only a bunch of ceramic artists would practice on a rare Maureen Love Lippitt. (Joanie once told me that if you do this long enough, you get over worrying about their value and fragility, and it is true.) I should probably mention that china paints wash right off if they are not fired. This poor guy did not stay like this, and was no worse for wear despite all of us using him as a glazing guinea pig. 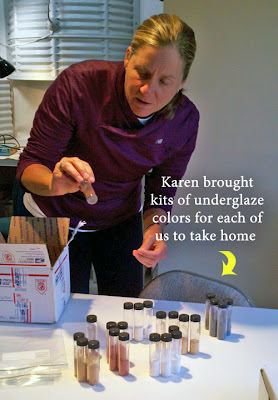 Karen has been documenting his real coloring on her studio page here. Here are Sarah and Lynn watching Karen work. All of us were sharing pictures over Facebook throughout the week, thanks to our smart phones. I am not sure if we posted more horses, or more food. I think it was food. Our last few days were spent learning how Sarah was using porcelain slip, particularly how she was using it for her claybody custom Reflective plaques. Because I do a fair bit of bas relief, particularly jewelry, this was of special interest. It was also what I dove into when I returned home, so I will probably explore the topic in more detail in future posts. 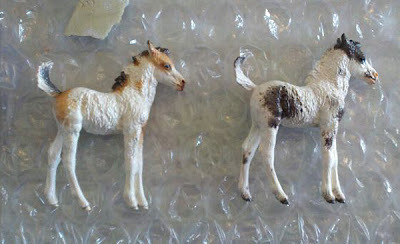 Sarah also cast a Pour Horse Limerick in the porcelain slip. Porcelain behaves differently than the low-fire earthenware we normally use. Conventional wisdom says that this will not work, at least not without extensive propping in the kiln – which is not something the members of our group have experienced. Still, does this look like someone who follows conventional wisdom? So I came home inspired, full of new ideas and perhaps a little less cautious. It doesn’t get better than that! I did bring home a few shiny things, like the “Brownie” pictured above, and molds to make more shiny things. And, as usual, I came home with a head full of new ideas and inspiration in abundance. Unfortunately what greeted me was a very, very sick husband. We took Alan to the emergency room the day after I arrived home, and he was diagnosed with pneumonia. The poor guy is now bedridden, so needless to say he is even more grateful than usual to have me home again! So I will be handling that, and getting things back in order in the studio, for the next few days. I do have a lot of things to share from the trip, but I’ll probably spread them out over several posts. 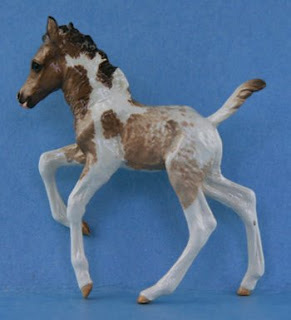 In the meantime, I will share one of the “formal” pictures of the first glaze Imp, the grulla pintaloosa “Butterbean”. A friend also pointed out to me that I should include something to show his scale, since my hands – which are really small – could be misleading. The original Imp was small enough, and earthenware shrinks another 6%, so he is smaller still.